I am scheduled for lateral release surgery again on my left knee thursday. 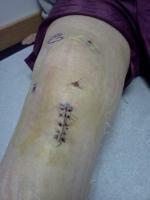 I previously had this surgery done on both knees in 2004. What would cause my kneecap to start popping out all the time and the tightness to come back again even though I have been exercising all the time. My doctor said it may be scarring formed but he is not sure.